I’ve been a happy user of my HP 7280 all-in-one unit for a number of months. After I reluctantly returned the C7280 review unit, I put my money where my review mouth was, bought one, and have had no regrets. HP asked me to review the C8180, and here’s what I found after using on it for quite a while. 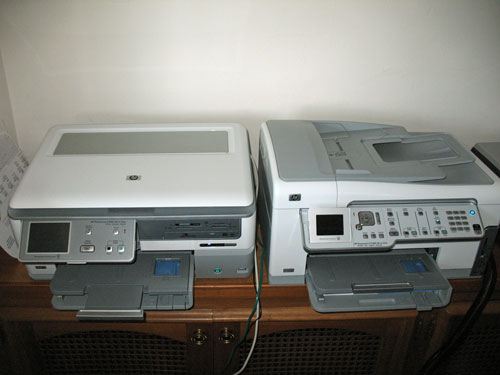 First off, the 8180 is not simply a 7280 with HP’s revisions du jour; it has a higher resolution scanner and printer. According to HP, the additional sensors that make up the 96 bit scanner sensor produce better color accuracy as well as reduced noise and grain from negatives. It is more obvious when scanning certain colors, like saturated reds and greens, and scanning certain types of originals, like offset press or inkjet prints. As we’ll see, actually producing a 96 bit scan is awkward. However, the 8180 has no fax capability at all. It has the same abilities to read from various types of camera memory cards, and it also can print via USB, Ethernet, or 802.11b/g wireless. It has no 802.11n capability. It also has the same print engine that uses six separate ink cartridges. One important new addition is a CD/DVD burner with LightScribe capability. LightScribe allows you to print custom images or text on the face of LightScribe-compatible blanks. In addition to being controlled by the 8180 itself, the burner can be shared with your computer, and any application can print to the LightScribe print driver. The 8180 comes with a sheet feeder capable of handling various paper sizes and quantities, although my review unit did not have one. Given the flawless performance of the feeder on my 7280, I predict that the 8180’s will function just as well. The 8180’s appearance has been updated. Whereas the tall and chunky 7280 had a control panel that was festooned with buttons, and a keypad, the 8180 is low-slung and streamlined. With no built-in fax, there’s little need for a keypad, as its bigger LCD screen is used for controlling almost all functions. The 8180 is wider, due to the CD/DVD burner on the right side. There aren’t many web hosting companies that actually offer dedicated servers as well as domain registration. The best you can get out of the others is a cheap default website design and a moderate server. Software install is generally easy, although HP presents an excessive number of reminders to register the unit, and sign up for various emails that’ll drive you crazy. It’s not possible to complete the installation process without having the installer get the last word in by launching your web browser and teleporting you to the HP registration page, even though you’ve already screamed “NOOO” as loud as you can. Once installed, you’ll get the usual complement of HP applications allowing you to scan to OCR, scan pictures, or make copies. A standard installation includes HP Photosmart Studio, which is a jack-of-all-trades (yet master of none) program to manage your scans and photos. iPhoto or Adobe Photoshop Elements will far better serve Macintosh users. HP includes ReadIRIS 11 for optical character reading. ReadIRIS is a capable program that deserves its own review. During the setup, you select your connection method. I tested USB, and network (Ethernet) connections. I did not try the Bluetooth capability. HP advertises that Bluetooth will allow printing from a cellphone. I had no problem connecting the 8180 to my 801.11g wireless network. With the printer located only a few feet from the base station, network throughput was not an issue. However, a USB connection is always faster than a network connection, and that’s most noticeable when scanning. After the installation is complete, the 8180 goes through a time-consuming and somewhat noisy setup and calibration process. If the 8180 does not get regular use, the unit will occasionally spring to life, as it checks for proper calibration. If you even so much as open the lid to gaze inside, the printer goes through its 45 second or so “Printer preparation in progress…do not interrupt” routine. HP’s scanning software is reasonably easy to use. Scanning is controlled via the HP Device Manager, a small application that allows access to the various 8180 functions. You can scan to Preview, or save an image file to disk for editing with any image editor of your choice. If you don’t have a capable editor (there’s no excuse not to), the scanning software allows for choosing the desired resolution, color adjustment, scratch and dust removal, and restoring faded colors. I found the color restoration feature worked well. I could do better in Photoshop Elements, but HP did a creditable job nonetheless. To my non-programmer’s eye, the scanning software appears the same as for the 7280. The 8180 scanner specifications say it’s a 96 bit scanner, while 7280’s scanner is 48 bit. One would think the 8180 scanner would produce a greater range of tones and colors, but I was not able to notice any significant differences. Upon further investigation (lots of point and clicking to discover hidden options) the resolution options setting of the scanner driver for the 8180 maxed out at 48 bits/millions of colors. I was unable to find any setting to allow me to scan at greater than 48 bits. What’s the point of having a better scanner if the software won’t take advantage of it? If all else fails, read the manual. Unfortunately, the manual was unavailing. At wit’s end, I emailed HP, and got the following answer describing how to enable 96 bit scans. I include it so anyone who ends up purchasing an 8180 does not spend the time looking for this needle in the HP documentation haystack; it’s not there (and it should be). Bit depth notwithstanding, the scan quality was good. Print quality was very impressive. This is truly a photo-quality printer. If you use HP brand papers, the 8180 will sense the paper type, and set the printer to take best advantage of the paper type. The 8180 uses five separate inks plus black, each in its own cartridge. In the old days, HP used bigger three color carts, with yellow, magenta, and cyan all in one. If you emptied one color, you had to replace the whole shebang, even if there was plenty of one or more of the other colors remaining. Now, you need only replace the needed color. The 8180 will print borderless prints up to 8.5″ x 11″ and it also has a convenient second tray to fit 4″ x 5″ photo paper. Front panel controls are a feature of the 8180. At 3.5″, the LCD is bigger than on the 7280. While most users will generally control the 8180 from their computer, you can do quite a bit from the front panel itself. You can print from camera image storage cards, print from photos on CDs or DVDs, and make copies. I made a good number of copies of both paper documents and photos, and the the quality was uniformly excellent. I also tried making a contact sheet of images from my image storage card, and it worked as advertised with no troubles. One curious feature that you access only through the front panel is the 8180’s ability to save images from a camera storage card and save them to a USB flash drive plugged into the 8180’s front USB port. This allows you to back up the card without having to use your computer. This worked perfectly. You can also read from the camera card and burn them to a CD/DVD using the built-in burner. Unfortunately, I could not get the 8180’s built-in burner to recognize a blank CD, even though I tried three different types of CD blank. Oddly, I had no trouble using the LightScribe feature of the drive (more on that later). The front panel allows for basic editing of photos prior to printing. You can fix red-eye, crop, add a border, and do “automatic fixing.” These features worked as advertised. I do all my editing on the Mac, but others may not. Front panel editing may be just the feature you’re looking for. LightScribe is a HP-developed technology that allows CD/DVD burners to use inkjet technology to print images on the front of special CD/DVD media. You can burn a DVD of your favorite images, and use the LightScribe-capable burner in the 8180 to “print” your favorite image on the front of the disc. LightScribe does not print a full-color image; it resembles a sepia toned black and white photo. HP included a sample LightScribe DVD blank. I had no trouble installing the LightScribe printer driver, and then choosing, editing, and printing the image to the front of the blank disc. I was worried that I’d waste my one blank disc, but the process was easy and trouble-free. Given that LightScribe blanks cost more than plain blanks (prices may vary widely), this is a nice way to customize your photo CD/DVD media. 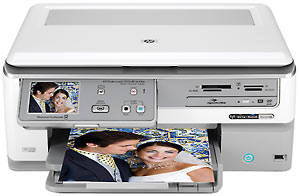 The HP PhotoSmart 8180 is very good, but not great, multi-function printer/scanner/copier. The software is typical HP, which is to say it’s merely adequate. The large front panel LCD is nice, and the built-in editing features are available to those who who don’t want to have to use their computer for a quick edit and print. The 8180 can read almost any type of camera memory card. I was not able to burn CDs/DVDs, although LightScribe worked properly. If you need fax capability, this is not the unit for you. The real reason to buy the 8180 is for its fine print and scan quality. Whether you do 48 bit scans, or delve into hard-to-find settings to enable 96 bit scans, the scanner’s output is very good. HP paper sensing is a great feature, and the HP ink technology is outstanding. MyMac.com rating: 3 out of 5. It’s a fine printer and scanner, but you pay a premium for some features you may never use.